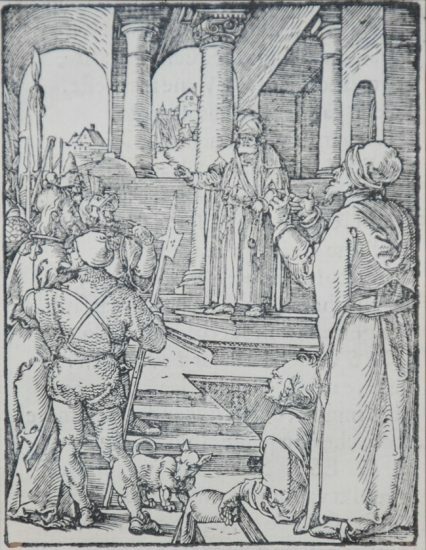 A lifetime impression, from the edition of 1498 with Latin text on verso. 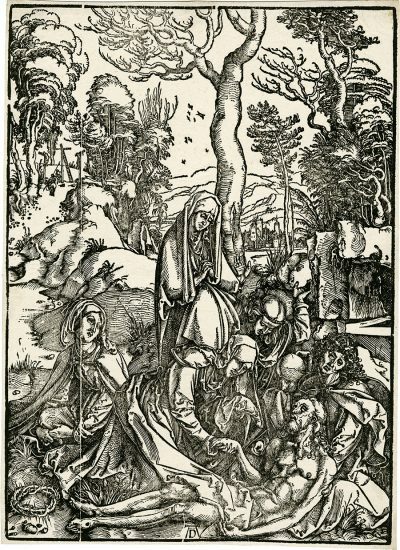 This work is monogrammed by Albrecht Dürer (Nuremburg, 1471 - Nuremburg, 1528) in the wood block ‘AD’ in the lower center of the image. This piece is in good condition, on a fine laid paper trimmed to the borderline. 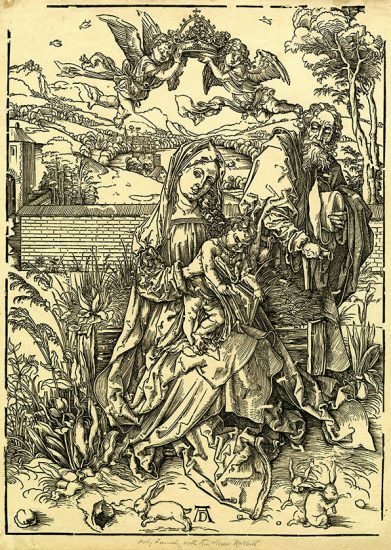 As part of the series, The Apocalypse, that Dürer had created based on the book of Revelations of Saint John the Evangelist from the Christian Bible, The Torture of St. John the Evangelist was the only woodcut that was based on legend, and not inspired from the book itself. 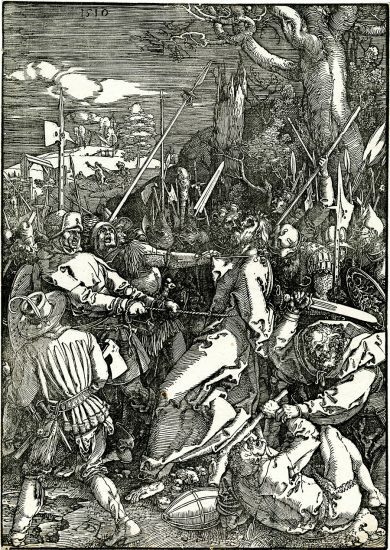 This allowed Dürer slightly more freedom in his depiction of the various vignettes that make up the background of this busy, bustling scene. The garments and setting are inspired by the artist’s own environment. 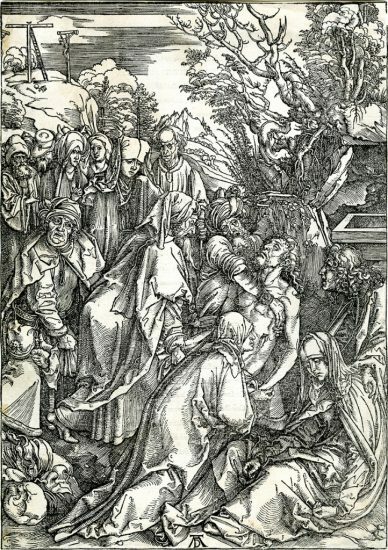 Within the bustling urban setting, Dürer’s rests on the ground of the cityscape. 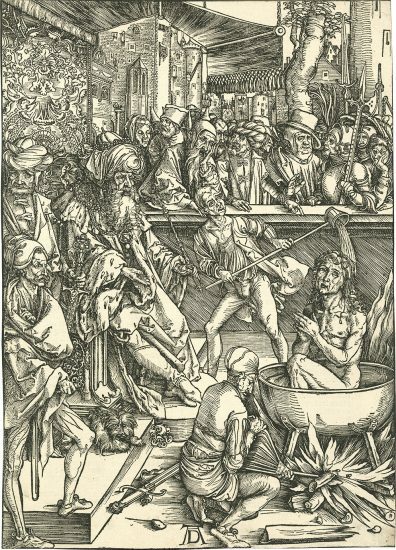 Created for the Latin edition of 1498 Albrecht Dürer The Torture of St. John the Evangelist from The Apocalypse, The Latin Text Edition of 1498 features the rare, latin text on the verso and is also monogrammed with Albrecht Dürer’s signature stamp, ‘AD’ in the lower center. With ¼” margins on all sides with the ink stamp of collector Georg Hamminger (Lugt 1159) who collected Dürer’s works during the late 19th century. 1. Bartsch. The Illustrated Bartsch Vol. 10. Edited by Walter L. Strauss. New York: Abaris Books, 1981. Listed and illustrated as catalogue raisonnè no. 61. 2. Boon, Karel G. & Robert W. Scheller. 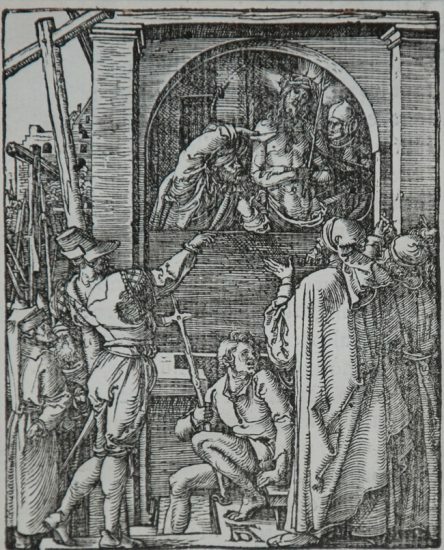 The Graphic Art of Albrecht Dürer, Hans Dürer, and The Dürer School, Amsterdam, 1971. Listed and illustrated as catalogue raisonné no. 164. 3. Kurth, Willi. The Complete Woodcuts of Albrecht Dürer, Dover Publications, Inc.: New York, 1963. Illustrated as plate no. 106. 4. Meder, Joseph. 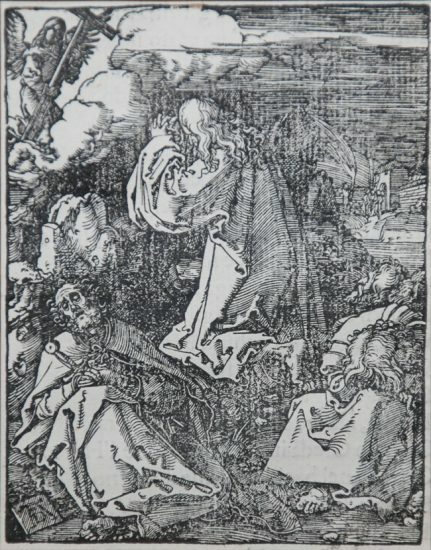 Dürer-Katalog, Vienna, 1932. Listed as catalogue raisonné no. 164. 5. Pawlak, Manfred, et. al. 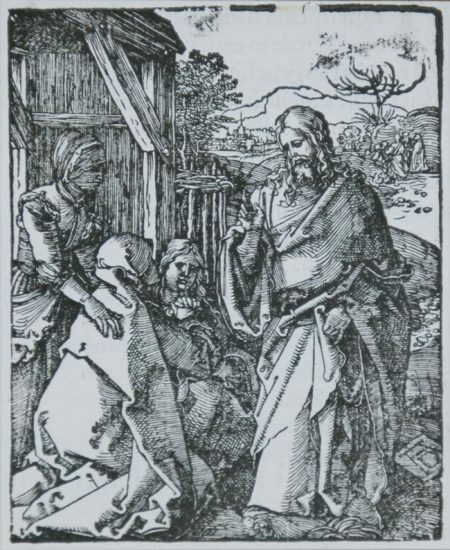 Albrecht Dürer, 1471 bis 1528. Listed and illustrated as catalogue raisonné no. 1492-3 with detail on the Apocalypse series on pgs. 1488-9. 6. 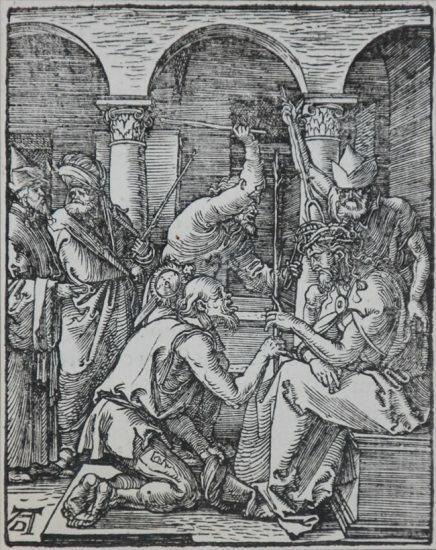 Schoch, R. Albrecht Dürer: Das druckgraphische Werk, Band II Holzschnitte und Holzschnittfolgen. München: Prestel Verlag, 2002. Listed and illustrated as catalogue raisonné no. 112. 7. Strauss, Walter L., ed. 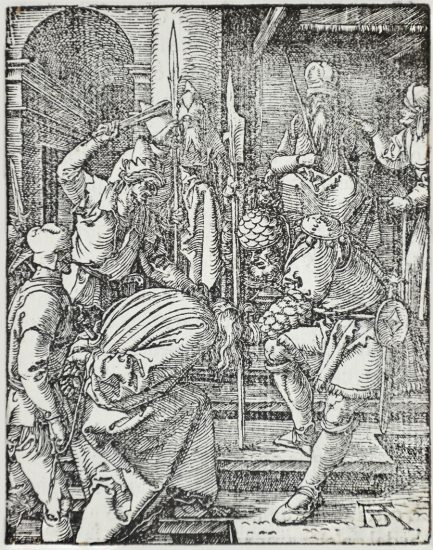 Albrecht Dürer – Woodcuts and Woodblocks, New York, 1980. Listed and illustrated as catalogue raisonné no. 54. 8. A Certificate of Authenticity will accompany this work. 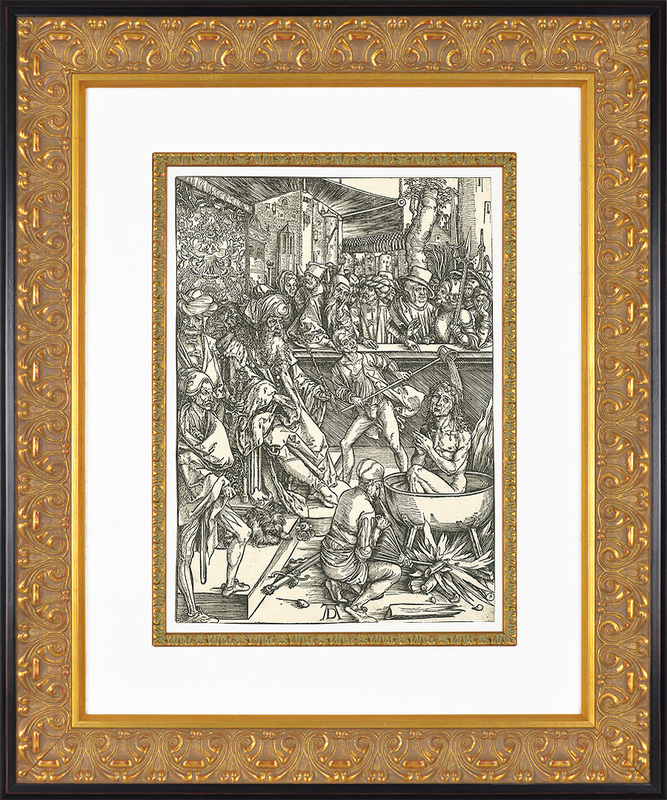 Albrecht Dürer The Torture of St. John the Evangelist from The Apocalypse, The Latin Text Edition of 1498 is framed to museum-grade, conservation standards, presented in a complementary moulding and finished with linen-wrapped mats and optical grade Plexiglas.